Bulls & Cows game guessing my code. The number of Bulls; digits correct and in the correct position (bull's-eyes). The number of Cows; digits correct but not in the right position. The first player to guess the other player's code is the winner. Guess: 1389 - Reply: 0 Bulls, 0 Cows. Guess: 1234 - Reply: 0 Bulls, 2 Cows. Guess: 1759 - Reply: 1 Bull, 1 Cow. Guess: 1785 - Reply: 2 Bulls, 0 Cows. Guess: 2745 - Reply: 4 Bulls! Over the years I've written programs to play Bulls & Cows on a variety of different computers, and I thought it would be fun to do one for the Arduino. I implemented it on an ATmega328 on a prototyping board, but it could equally well be run on an Arduino Uno board. The Bulls & Cows program not only thinks of a code which you are to guess, but tries simultaneously to guess a code you have thought of. When the program first runs, press "*" to continue from the "Hello" message. Enter a four-digit guess, and press "*" to continue. Alternatively if you make a mistake you can press "#" to clear the display and enter the guess again. The game continues until either you guess the computer's code, in which it displays "I LOSE", or it guesses your code, when it displays "Ho-Ho", but allows you to continue trying to guess its code. One obvious way of finding the number of Bulls and Cows between two numbers is to make four comparisons between digits in corresponding positions to get the number of Bulls, and then make the remaining 12 comparisons between digits in different positions to get the number of Cows. Digits contributing to Bulls or Cows at any stage must be deleted so they cannot be counted again. The execution time with this method is proportional to the square of the number of digits. A better method, used in the following program, has an execution time that is only proportional to the number of digits. The method is to keep counters for each of the ten possible digits in an array Spectrum. Initially the counters are set to zero. Digits in the two codes are then compared a pair at a time. If the pair matches it is counted as a Bull. If they do not match, the counter for the digit in one code is incremented, and the counter for the digit in the other code is decremented. If incrementing a digit counter gives a negative or zero result, a Cow is recorded because the counter must at some earlier stage have been decremented due to an occurrence of the same digit in the other code. Likewise, if decrementing a digit counter gives a positive or zero result, a Cow is recorded for the same reason. Since every guess reduces the number of possibilities, eventually the algorithm arrives at the correct code. For efficiency it puts the next try at the end of the list of guesses, with the impossible reply "44". If this is the first guess that isn't compatible with the replies we know that all the previous guesses were compatible, and so this is a valid candidate. If the player has given inconsistent answers to the program's guesses it will, at some stage, be unable to find any guess which is suitable. In that event it displays "Error" and claims a victory. The program first seeds the random() function from millis(), to ensure a different sequence of numbers each time the program runs. It then proceeds through the turns, first showing the score for the player's guess, and then guessing the player's code. Additional routines ShowMessage() and ShowScore() display a message and the Bulls and Cows score respectively. The 12 keys on the keypad I used are arranged in a 3 x 4 matrix. The columns are connected to the same I/O lines that drive display digits 0 to 2, and the rows are connected to bits 0 to 3 of PORT C. The state of each column is read during the display multiplexing by the DisplayNextDigit() routine, and put into the corresponding element of the array Keys. The Read() routine also handles the "*" and "#" keys. To keep the project as cheap as possible I used a standard 12-key keypad, available from SparkFun  or HobbyTronics in the UK , and two 0.28" 3-digit 7-segment LED displays, bought on eBay from a supplier in Shenzhen for £1.30 for five! 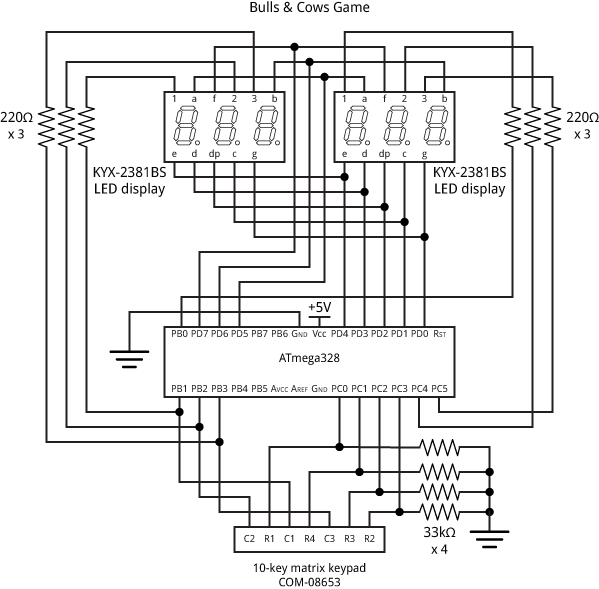 Circuit of the Bulls & Cows game based on an ATmega328. Layout of the Bulls & Cows Game on three mini breadboards. I used an ATmega328 chip with the default fuse settings, which gives an internal 1MHz clock and avoids the need for a crystal. I uploaded the program to the ATmega328 using Sparkfun's Tiny AVR Programmer  (available in the UK from Proto-PIC ), using the ATmega328p (internal 1MHz clock) option on the Boards menu. The circuit was powered from a 50mAH rechargeable lithium battery; I use the HobbyTronics LiPo charger  to charge it. Here's the whole program for the Bulls & Cows Game: Bulls & Cows Program. 12th March 2015: I've added some minor improvements. 31st March 2015: For an improved version see Bulls & Cows Game 2. ^ Number Bulls & Cows on Pencil and Paper Games. ^ Keypad - 12 Button on SparkFun. 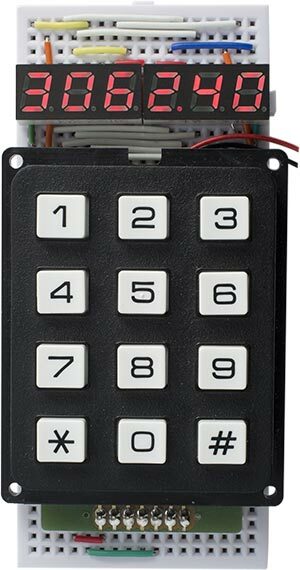 ^ Matrixed Data Keypad 3 x 4 on HobbyTronics. ^ Tiny AVR Programmer on Sparkfun. ^ Tiny AVR Programmer on Proto-PIC.